I have three kids and a job, so that means I am constantly driving someone somewhere and waiting. Plus, I am an organizer, so I hate to waste time. Here are 9 ways I have found to not waste time while waiting. 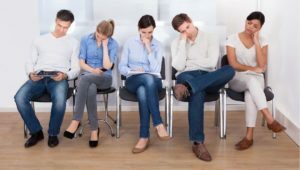 Between sports activities, client sessions, doctor visits and then the more fun unexpected things like cavities, physical therapy or early school closings for heat, I find myself waiting in check out lines, carpool lines, outside clients’ houses or doctors’ waiting rooms at least once a week. I could view this as lost time and get frustrated at all the time I am WASTING…….OR, I can look at it as found time in my day! Make your own doctors appointment. When was your last check-up? Often when taking care of our family we forget to take care of ourselves. We have created a Health Care checklist on our website, just click here to download it. Send a text or email to that friend you have been meaning to call. Set up a time to meet. Send a text to your spouse or partner. You would be amazed the effect a simple “I love you” text will have. Check your calendar. Make sure you have not forgotten any important dates. Check for overlaps or missed appointments or important events. While you are at it schedule “ME” time! Use your smart phone for more than Candy Crush. Check out the app store for new apps. New apps are constantly being introduced, you never know when the app you have been looking for will pop up. This may be the only “ME” time you get all day! Don’t waste it! Go ahead and read a book or even take a few minutes to meditate. Plan your next party or dinner with friends. Write up the guest list and create the menu and shopping lists. Do a brain dump. There are always about 10-40 things going on in my head and putting them down on paper not only reduces the stress of having to remember, but it allows you to schedule those tasks on the calendar or create a to do list for the next day. If you hate wasting time as much as I do, follow this next tip. Next time you are headed out the door, be prepared with your phone fully charged and put a book and notpad in the car so that when you are stuck waiting, you can make the most of your time! If you liked this article, you’re welcome to use it in your own newsletter or blog as long as you include the following blurb: Joan Robinson, our Senior Project Manager, helps families get organized and declutter so that they can focus on what’s important. Get our FREE weekly tips and advice at www.NoMorePiles.com.